Our master bedroom has long since been one of the most neglected rooms in our house. Even our guest bedroom has received more love than our master. My goal is to start to focus attention on it, starting with an easy upgrade I made to our Ikea dresser with some of these beauties. Let's take a look at what we were starting with, nothing too fancy, just your basic Ikea Hemnes Dresser. I bought this when we first moved into the house, and it has been in the exact same place, looking the exact same way for the entire time. If you pan out a little bit, the view doesn't get any better. You can see the slant of our ceilings due to our Cape Cod style home, which greatly limits our furniture choices. If you can't tell it's that line running through the top of the picture behind the lamp, that horribly uneven line which drives me crazy. I knew that changing out the knobs would provide an easy and quick update to this basic looking dresser. I had been on the search for awhile, not knowing exactly what I was looking for. It's always one of those things where I'll know it when I see it. One of my favorite places to look for knobs is Hobby Lobby. I've noticed that even lately there selection is growing even more, and more often than not you can find them for 50% off. In fact, I don't buy them unless they are 50% off, because if they are not on sale when you are there, they most likely will be the week after. Since I was in the market for 12 knobs for my Ikea dresser I wasn't looking for anything too fancy, aka too expensive. When I came across these glass beauties I knew they fit the bill at $4.99 a piece and with 50% off I ended up paying just $2.49 for each one, making this upgrade ring in at just under $30. All I needed was a screwdriver and about 10 minutes and I easily had all of the knobs switched out. I love updates that are this quick and simple. The impact from far away is subtle, but I love that the look of the glass, it makes it just a little fancier. I feel like the impact in person is a lot greater than in the photo above. Probably because the shape is so similar to what we started with, when photographed from a distance it's going to look pretty similar. But then you get up close and you can see all the beauty that the glass brings. I love that no two knobs are exactly the same, they all have little subtleties to their color, and the light hits them all slightly different. I also love the little brass piece that attaches them to the dresser. Now we have wood, metal, and glass all mixing together, I love the different textures. It's exactly what I am going for in our master. Not a ton of color, in fact our color palette right now is mostly neutrals, and I plan to keep it that way. But I hope to keep it interesting with a bunch of different textures. I love how it reflects in my new favorite Home Goods find, this beautiful full length mirror that I just can't get enough off. Well, almost. I fell in love with this mirror in the store, and I thought I did the mirror check and it was ok. You know, is this a fat mirror check, because we all love a skinny mirror, right?! Please tell me I'm not the only one who does this. Maybe this comes from my years of dancing and spending way too much time seeing myself in mirrors, but we always knew which mirrors were the "fat" mirrors and which mirrors were the "skinny" mirrors . Anyways in the store I thought "This mirror is great, it's a skinny mirror", and I don't know if it's how its hung or what, but one I got this mirror home it so became a fat mirror! But that doesn't change how beautiful I think it is every time I look at it! Now it's onto the rest of the room. I'm sure it won't happen quickly, but at this point something is better than nothing because it has spent way too long being neglected! Love that you did this simple upgrade!! You picked great new knobs! 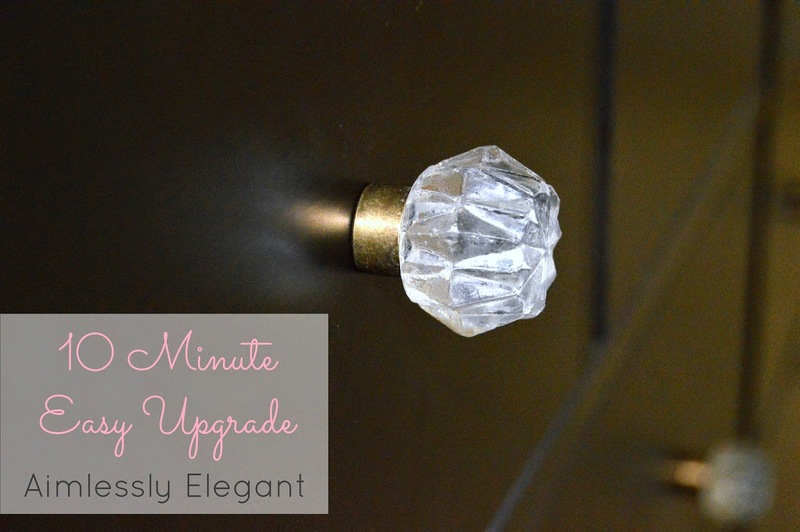 I never would have thought of changing the knobs to update the look! You're so good at all this DIY stuff! :) Oh...and I love that mirror! Thanks Felecia, it's amazing what a small change can make! It took awhile to find them, but I'm glad I held out for them! Changing knobs out is super easy, you could so take it on! That mirror, I walked around the corner in Home Goods and instantly knew it was coming home with me! I've been looking for inexpensive knobs for a while now - I never thought to check out Hobby Lobby! I'll definitely be making a stop there next time I'm in NY! They have a great selection, some of them could even look like they came from Anthropologie, but for much cheaper!